We have been hand crafting our unique jewelry for more than 40 years. the designer and sales manager. We buy pre-1965 US silver coins from coin dealers which are high content 90% silver (Sterling is 92.5%) and they are rolled flat on a rolling mill. 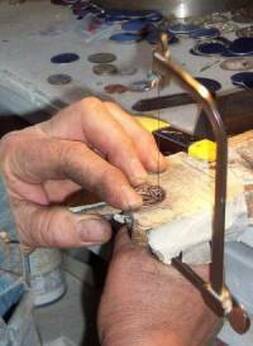 The milled edge of the coin becomes the edge of the finished pendant or earring and is evidence that the piece was created from a coin. We use dimes, quarters, half dollars and silver dollars to create different sizes and thickness in the finished piece. One coin creates one pendant or earring. The design is drawn on to the flattened coin and then holes are drilled for the spaces in the design. The saw blade is detached at the bottom and then threaded through the first hole in the design. It is then reconnected to the saw frame and the hole is then cut out into the design shape. This process is repeated for each of the spaces desired for each design. For some designs engraving is done next with a hand engraver to add detail and depth. The piece is now taken to the buffing wheel and polished to a high shine which removes any of the original coin design from the front and back of the coin. Jim and one of our beloved golden retrievers at the bench. That's the rolling mill in the foreground.